Given that there was nothing left in my vegetable crisper but kale and purple cabbage, I thought today might be a good day to actually leave my apartment and go to the grocery store. I trudged through the obnoxious Chicago cold (which isn’t even all that cold by Chicago standards) and packed my shopping basket full of veggies and vegan goodies, then trekked back with my shoulders weighed down by All the Things. 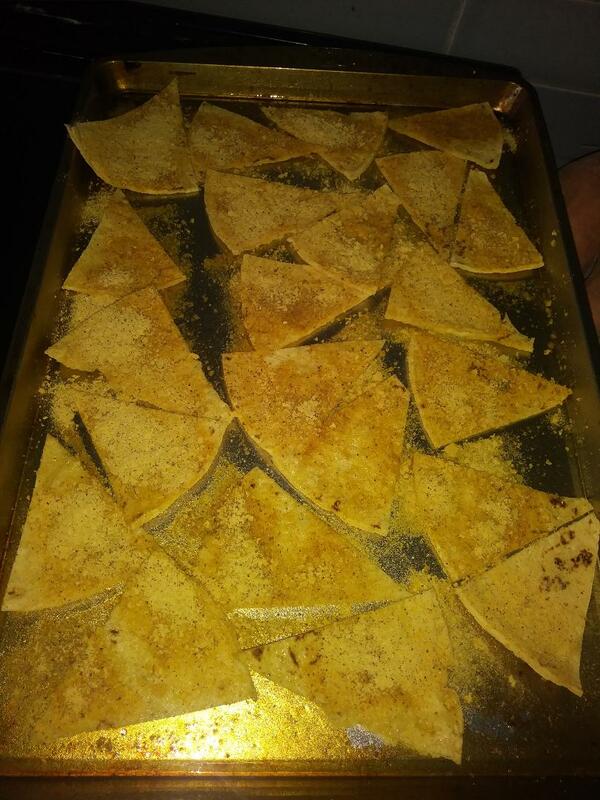 If you can’t be bothered to click (and let’s face it, this blog is a pretty awesome place, so I understand why you wouldn’t want to leave), you essentially stack up some corn tortillas and cut them, pizza-like, into Dorito-ish triangles. Next, you whip up a spice mix that involves nutritional yeast, chili powder, paprika, turmeric, and salt (and garlic powder and onion powder, though I omitted those and the chips still tasted amazing) and either mix them with oil or just coat the tortillas with oil and sprinkle on the seasoning. I did the latter, first spraying on olive oil and then, when the olive oil canister gave up the olivey ghost, using regular liquid olive oil and spreading it on the chips with a paper towel. After that, you bake your seasoned tortilla bits at 400 degrees Fahrenheit for three or four minutes on each side, and bam, delicious chips. 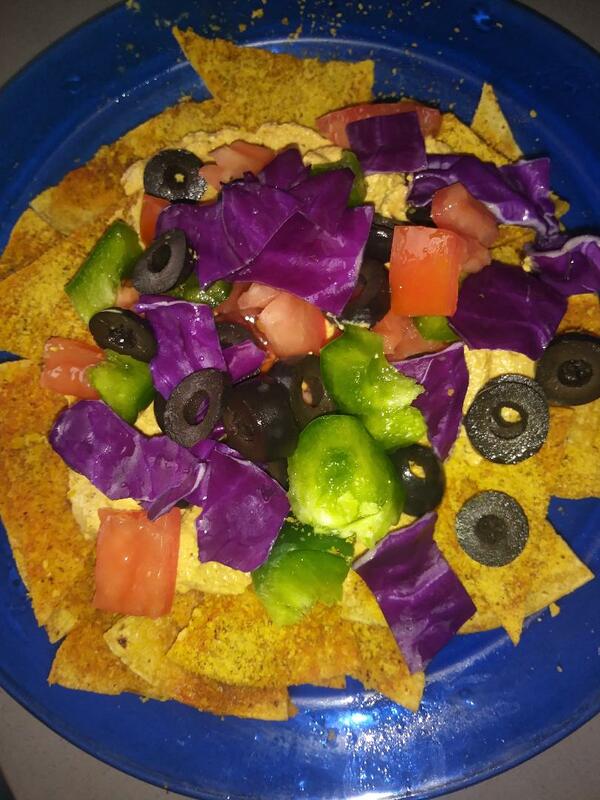 I decided to take mine an additional step and make nachos out of them, so I added a bunch of random vegetables – tomatoes, green peppers, the aforementioned purple cabbage, and black olives. I also took the last of the seasoning and put it in the food processor with firm tofu and some vegan mayo, and that served as the basis of a “cheese” of sorts to spread over the chips. Now, the chips themselves didn’t end up all that crispy – they came out a bit chewy, actually – so I probably either didn’t bake them for long enough or didn’t flip them well enough. Whatever the case, I can at least confirm that the seasoning absolutely does taste like the probably-actual-crack they put on real Doritos. It made for seriously delicious chips, very flavorful and naughty-tasting without actually being naughty, which of course is what we strive for in all things food-related. For dessert, rather than making yet another mug cake (I may need an intervention on that front, actually), I took advantage of having fresh fruit and veg in the house and made a Chocolate Banana Avocado smoothie, which essentially contains all the things I just listed (half a banana, half an avocado, cocoa powder) + soy milk and a healthy squeeze of agave nectar for sweetness. I found a lovely little can of “Coconut Whipping Cream” at the grocery store, so I followed the directions (refrigerate the can overnight, then scoop out the coconut cream and mix with a hand mixer for three minutes) and glopped a ton of the stuff into my smoothie. And yeah, that was pretty much amazing. I highly recommend the coconut whipped cream + anything chocolatey and sweet, because…yeah. Deeelicious. Reviewing the things I ate today, I feel like I ate some extremely delicious stuff, but nothing was really unhealthy at all. A light spritz of olive oil on the chips, a little salt in the Dorito seasoning, and a small amount of sugar in the coconut whipped cream. I had lots of veggies and fruit, and even the corn tortillas were baked, not fried, so I’m feeling pretty good about my culinary creations overall. Of course, I’m also very full and wanting to take a nap with the cats, but that’s just part of my life these days, it would seem. A brief cat interlude: Benny takes a nap dangerously near his camera-crazy owner and thus has only himself to blame for ending up on YouTube. In which I venture to the Japanese supermarket and experience Great Sadness, then discover a wealth of vegan items closer to home + try the Beyond Burger. Also, miso ramen and vegan tonkatsu! Kind of. It’s a freezing cold day in Chicago, and I’m heading out in search of groceries and T-shirts. Also, let’s talk some more about religion, because I see fire and immediately put my hand into it, apparently. Testing out my Japanese camera again, I show you the ins and outs of making blurry, under-popped popcorn with a liberal application of vegan seasonings, none of which are expired. Hooray! Long-time visitors will recall that I’ve been working on an LGBTQ+ fantasy novel called Chosen for approximately the last 17,000 years. Its main character, Kaine Ikarra, is a fifteen-year-old transgender boy who is struggling with magic, identity, and the fact that most of the people around town want very much to kill him. It’s tough being fifteen, man. As I’ve mentioned before, this story started out during my teen years as a cookie-cutter White Dudes Doing Cool Stuff In A Fantasy Setting book, but it’s since evolved into a series that features mostly LGBT people of color doing even cooler stuff in a fantasy setting. Since this is a fantasy world entirely of my imagining, I can do what I want with it, such as making the dominant religion a pantheon of gods and goddesses, many of whom are gay, lesbian, bisexual, transgender, etc., and this thus makes LGBT folks entirely normal and unstigmatized in this world. Likewise, the inclusion of a female chief goddess (and various other awesome females in the pantheon) encourages more gender equality, which means that gender roles in this society are far more equal, and that gives me the opportunity to have kickass ladies all over the place and not have that be at all weird. The latest I Can Do What I Want aspect of the story has involved my going through the book and subtly altering what everyone is eating so they subscribe to a more plant-based diet. It’s not something you see often in fantasy books, I’m willing to bet, but given my own commitment to avoiding meat and animal products, I figured…why not? WHY NOT HAVE THEM ALL BE VEGAN. MUWAHAHAHAHA I’m drunk with godly writing power. Instead of sitting around growing cobwebs while waiting for UPS, I thought I’d make another vlog. This one concerns a strange brightness in the sky over Chicago and my recent vegan cooking experiments.